New Leighton Buzzard golf club Captain, barrister Jeremy Taylor and his vice, Judge Robbie John from Bletchley. A Milton Keynes based golfer has taken over as Captain of the Leighton Buzzard club where his “vice” for the year will be a colleague from Bletchley. Barrister Jeremy Taylor, who lives in Nash, was installed as the new Captain of the Leighton on Sunday, dressed as a convict, handcuffed to two police officers, manacled with chains and belted with water bombs whilst locked in stocks after being sentenced to 12 months hard labour. 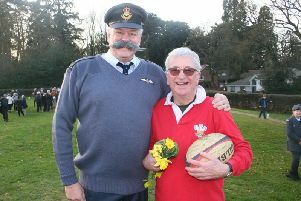 The drive-in ruse was organised by newly confirmed Vice Captain Robbie John to reflect Jeremy’s 40-year legal career. Jeremy, 64, is currently a Senior prosecutor with the Crown Prosecution Service. He was convicted by a jury of around 150 members, and escorted to the first tee for his sponge-bob water punishment orchestrated by Past Captain Adrian Stephenson and Ladies Vice Captain Carmen White-Lawes. Ten years a member of the Leighton club, Jeremy, whose partner Rosie was Captain of the Ladies section of the Plantation Road club four years ago, will during his year of penance, be jointly raising funds with Ladies Captain Patti for Macmillan Cancer Care and the Soldiers, Sailors and Airmen Forces Association which helps ex-servicemen with health and other service-related issues. A two-clubs and a putter competition, the traditional event on Club Captains’ drive-in day, was won by Emerson Valley software engineer Bryan Bateman whose 21 points on the back nine earned him a countback win over Phil Eddy after both finished with 35 points. Bryan’s son Shin, a 17-year-old student at Shenley Brook End school, is this year’s Junior Captain of the Leighton club. Bletchley businessman Derek Shaw won Leighton’s new year Cross Country competition with a score of 15.3.